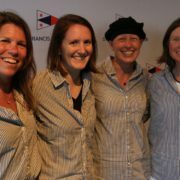 Tracy has been an avid sailor since youth and raced at many levels, from dinghies, one design and larger sailboat handicap racing. Having begun in Lasers, he returned to them with a passion in the 1990’s and has become a regular on the Laser Masters circuit. 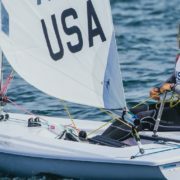 In addition to sailing Lasers he also devotes much time to the class association and now serves as the President of the International Laser Class Association. In his professional life, he is a Research Scientist in Physics and has spent more than twenty years working at the Stanford Linear Accelerator Center. He grew up in Monterey, California, attended the University of California, Irvine both as an undergraduate and graduate student and has been living in the Bay Area since 1989.